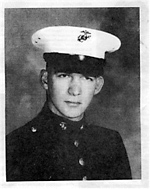 PRIVATE FIRST CLASS JOSEPH EDWARD LAUER was born on December 19, 1948. His home of record is Gibbsboro, NJ. Joseph was the only son of Clarence and Catherine Lauer. Joseph belonged to the Class of 1967, the first graduating class of Eastern Regional High School. Involved in many school activities, Lauer was a member of the Drafting Club, Drama Club, Grid Club and Gymnastics Show. A member of the baseball and football team, Lauer was accepted into the Varsity Club. After graduating from Eastern, Lauer enlisted in the US Marine Corps and volunteered to go to Vietnam. He attained the rank of Private First Class. Lauer’s tour of duty in Vietnam began May 8, 1968. Only 23 days after arriving in Vietnam, he was tragically killed in South Vietnam, as a result of mortar fire. He was awarded the Purple Heart. After Lauer’s death, his legacy still prevails through Eastern Regional High School and his community. In Gibbsboro, a memorial park and a street have been dedicated in Lauer’s memory. In the Gibbsboro American Legion Hall, a showcase memorial pays tribute to Lauer’s life. On May 21, 1998, 30 years after Joseph Lauer’s death, Eastern Regional High School held a memorial assembly for the entire student body to recognize and remember this student that sacrificed his life for his country. There was a long round fluorescent light stretched across the top of the garage door and its glow flooded the winding suburban street and lighted the way for the people who moved softly up the stone walk that cut across the terraced lawn of the modest split level home. There were six small American flags jutting up from the lawn, standing on pencil-thin sticks and flapping in the soft evening breeze, and there was a black wreath on the door frame, just below the black stenciled numerals that told you this was 49 Winding Way in Gibbsboro, New Jersey, USA. And there was the service flag in the window. The service flag was bordered in red and out of a field of white satin, you were hit by a large gold star. The gold star told you why there was a wreath on the front door and why men in American Legion caps stood out on the lawn and why the people kept coming and going all afternoon and evening and late into the night. Joey Lauer was dead. Dead at 19. He got it in Vietnam three weeks after he arrived. He was killed on May 31st and it took 12 days to fly his body home and now Joey’s friends were tip-toeing into the white shingled house on Winding Way and kneeling in prayer at the glass-covered casket that was draped by a huge American flag. There was a floral wreath next to the casket. It was made up of red carnations and it was shaped in a big heart with a red satin ribbon with gold letters that read “Joey Forever” and when people saw the wreath, they came apart with grief. Kids get killed in Vietnam everyday and they fly the bodies home and relatives and friends call to say goodbye. It seems to be part of the American culture now, war and death. Joey Lauer was born in 1948, which means the kid could hardly remember a year that his country was not at war, but when it was Joey’s time to go, he joined the Marine Corps and volunteered to go to Vietnam. And now he was home in a box. 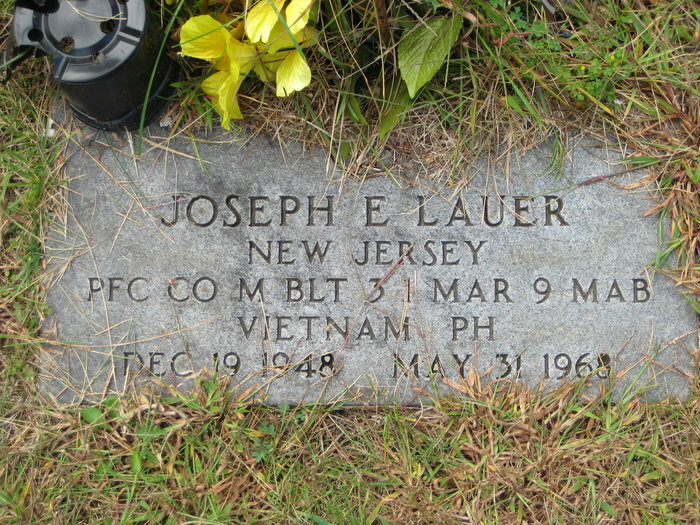 PFC Joseph Lauer of Gibbsboro, New Jersey, was the youngest of the five children of Clarence J. (Joe) Lauer. Joey was old Joe Lauer’s only boy. Old Joe Lauer, who is 50 (in 1968) now, could be bitter about the war, but he is an extraordinary man. He says he is not bitter at all because he says his family knows that their boy did not die in vain. “Our sorrow has been turned to joy by a feeling of pride that our son gave his life to a cause that he believed in and that guided his every action,” old Joe Lauer wrote. Joe Lauer is not a writer by trade. He’s in the retail fish business. He operates a fish market in the 2700 block of North Front Street in Philadelphia, but old Joe Lauer is more than a fish market operator. There is a bit of a poet in the man and a bit of the philosopher and a whole lot of old-fashioned American patriotism. When he got word on June 3rd that his son, Joey, had been killed in action in Vietnam, old Joe Lauer wrote a letter to his customers at the fish market and tacked it up in the window. The letter showcased old Joe Lauer’s great heart and the words he wrote telling of Joey’s death at 19 in far off Vietnam told you that the people that make up America are not sick but are strong and brave people who can find solace in tragedy. It's hard to believe it has been 40 years since you graduated; 39 since you gave your all... We are still fighting around the world for freedom; now I have a nephew in Iraq... He is the same age your were when you volunteered. Another year another war the US is still fighting for freedom around the globe. Others follow in your footsteps I pray they have your determination and conviction. Your sacrifice is remembered. Semper Fi, Joey! Well, Joey, it's been 37 years today. I still think of you often. Semper Fi! Joey was my first cousin. He volunteered without regrets. He died as his lived committed, honorably, and giving his all. He is remembered fondly and often, and has served as a role model in the many years since his death. Semper Fi!